Gas appliances were introduced to British homes in the late-19th century. They were very expensive, however, and only the wealthy could afford to buy them. 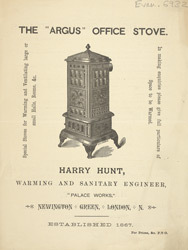 As a result, small wood burning stoves, such as this Harry Hunt-designed office heater, remained popular. Wood-burning stoves did not need much maintenance, and as this advertising flyer states, they could be left unattended for several hours. Hunt’s stoves were beautifully designed and intricately decorated.